MCR Safety strives to create the most comfortable and durable welding products on the market. 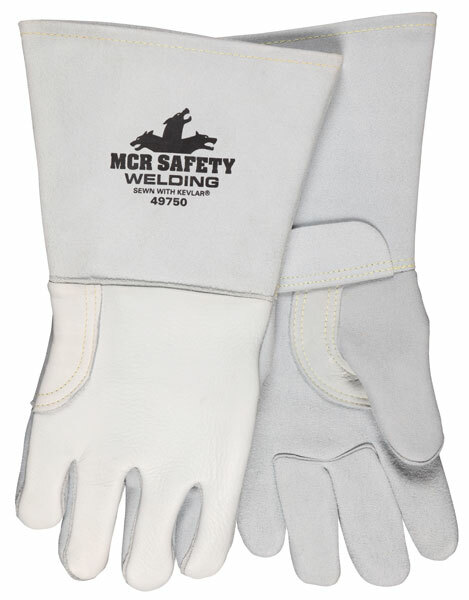 The 49750 Elkskin welding gloves are constructed with pearl gray premium Elkskin leather. The back of the glove is made with top grain Elkskin and is cotton/foam lined for greater protection. The palm is unlined reversed grain for greater comfort against the hand. The drag patch, reinforced thumb and DuPont™ Kevlar® thread provide additional protection. The 5’ split cowhide bell cuff and wrist patch provide excellent protection in the wrist and forearm area.